Nest restaurant in town! A hidden gem of Barcelona! Great service! The pasta is good but the pizza better. Buenísimo! Amabilísimos! Baratísimo! Ideal para ir con amigos y compartir esas gigantes pizzas. Repetiremos!!! Really nice atmosphere, food and service! Restaurant was empty when we went in which was intimidating as according to trip advisor reviews it was busy and lovely. Regardless we sat down and the pizza was one of the best I’ve ever had and the staff were lovely. Two normal pizzas and two pints were less than €30. Unreal value. Hi Rebecca! Thank you for your comments. Excellent food, service and the pizza was hugeeeee! Hi Luke! Thank you for your comments.We are happy that you enjoyed your experience in Les Dues Sicilies. We look forward to welcoming you back in the near future :). Great service from lovely waiter. Good food. Kids enjoyed. We are happy to hear that you enjoyed your meal on your recent visit and that are team gave you such a warm welcome on arrival. ¡Gracias Nat! Para nosotros no hay nada más importante. Nos alegra que tuvieras una buena experiencia y que consideres nuestra pizza la mejor :). Nos esforzamos día a día para que así sea. ¡Esperamos verte muy pronto! Very nice Roman style pizza, good service and a great tiramisu! Thanks so much for your nice review. Its great to hear that you enjoyed our food and had a good time. It was very loud in the restaurant and the food was not as expected. Hi Tim, we're sorry to hear that. We will do our best to find appropriate solutions. Hi Johan! Thank you for your comments. We so glad you enjoyed your dinner with us. We hope to see you very soon :). Excellent place and great cuisine! Thank you Sanna! 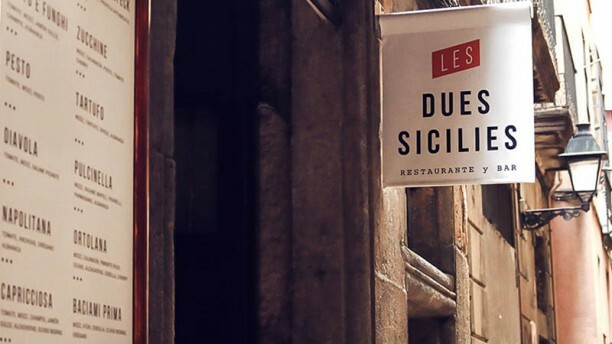 We are happy that you enjoyed your experience in Les Dues Sicilies. We hope to see you soon :).